This incredible resource makes adapting therapy to include literacy simple, fun and inexpensive. Whether you’re an OT, SLP, PT, educator or parent, Fun with Literacy gives you hundreds of multi-disciplinary activities to improve literacy skills in children ages birth to preschool. "Dr. Thatcher's Fun with Literacy is chock-full of creative ways to bring literacy skills to life by providing tools for multi-sensory experiences that will engage young children and their providers across disciplines. I highly recommend this book with its many pages of templates and activities that will provide valuable opportunities to engage and delight in the joy of learning together." 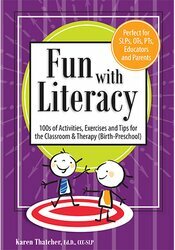 "Fun with Literacy is an innovative and comprehensive resource that illustrates the challenges and opportunities of literacy development in children and special learning needs. It provides all of the ideas, lessons and materials to deliver a multi-faceted and evidence-based approach for young children who struggle with literacy and learning. The highlighted children's books are classics that will be easily encountered in homes, daycares, classrooms, and libraries. This program matches a universal design for learning approach to clinical practice as it facilitates attention to motor, language, and cognitive skills while tackling multiple means of understanding, expression, and engagement. The Literacy into Therapy Plan will be a key feature as speacial education teams work together to collaborateon educational programs for individual and groups of children. A must-have rsource for any professional working with preschool and early school-age children who have special learning needs."